London, UK – 18 March 2019– Arch (www.arch-global.com),a leader in user experience software solutions and VANTIQ today announced their partnership to deliver real-time, event-driven applications in the UK. Using VANTIQ’s Modelo application platform, Arch customers will be able to benefit from the fast deployment of real-time applications that are truly event-driven, exploiting the IoT and AI for high value digital transformation projects. “Organizations need to be able to deliver on the promise of the digital economy quickly and economically. The VANTIQ platform has so much functionality already that it allows us to build high added value solutions without the overhead of integrating disparate components. The one piece of integration our customers want – to SAP – we know inside out. 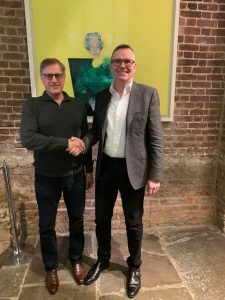 We are very excited and proud to be amongst the first VANTIQ partners in the UK for this game-changing technology.” said Henry Blythe, Arch CEO. “VANTIQ’s platform and Arch’s expertise are the perfect match for ensuring companies in the UK can drive truly transformative business outcomes,” said VANTIQ CEO Marty Sprinzen. Arch is a market-leading provider of usability software that brings together the power of SAP solutions with the simplicity of user-friendly interfaces. It delivers business solutions that help empower organizations of any size to realize huge process efficiencies and deliver enhanced engagement. The company is privately owned and headquartered in the U.K.
VANTIQ and Modelo are trademarks of Vantiq Inc.
For more information, please contact: Chris Scott, chris.scott@arch-global.comor Dana Dye, ddye@vantiq.com.